When I wrote for YourHub, one of my most prominent features was TV Blogging. This is where I review a TV series week-to-week, posting an in-depth analysis shortly after episodes air. I am happy to announce that TV Blogging is about to become a regular part of the rotation here on www.jonathanlack.com, starting with archival reviews of two shows I had been following at YourHub. At Comic Con this weekend, the cast of BBC America’s Doctor Who announced that the perennial sci-fi classic will return for the second half of its sixth season on Saturday, August 27th, while NBC announced a few weeks ago that spy-comedy Chuck will debut its fifth and final season on Friday, October 21st. Since all my reviews for these shows have now vanished from the internet thanks to YourHub’s recent redesign, I’ll be re-posting many of those articles here on the blog in the weeks leading up to the premieres, and it all starts this Friday and Saturday. I started doing TV Reviews with the fourth season of ABC’s Lost back in 2008; my Lost articles were quite popular on YourHub, and so I started adding other shows to the rotation. If you are new to my writing, you’ll find that my TV articles are different than traditional ‘reviews’ – since I only write about shows I enjoy, there’s not a lot of praise or criticism to dish out each week, unless the episode is particularly spectacular or disappointing. Instead, these articles are more like essays about the content of the episodes, analyzing various story points, character arcs, predictions for coming episodes, etc. The articles will look more or less the same here as they did on YourHub. They will look literally the same for the next few weeks, actually, since I’ll be re-posting my reviews of the sixth series of Doctor Who and fourth season of Chuck as we head into the new seasons. These reviews will go up – mostly in pairs – on Fridays for Chuck and Saturdays for Doctor Who, and when I begin publishing new articles, they will continue on the same days (usually in the evening). That might be complicated for Chuck, since Friday can be a busy night, but that’s the plan for now. There were seven episodes in the first half of Doctor Who’s sixth series, and as of this Saturday, there are four weeks until the premiere. Thus, the first three Saturdays will contain “double-feature” posts, with two episodes reviewed in one! The final Saturday will be my review of the mid-season finale, and on August 26th, the day before the premiere, there will be another article summing up the first half of the season. Doctor Who – Series Six Part One “Flashback” Reviews begin this Saturday, July 30th. In the case of Chuck, the last season had quite a few more episodes – 24 in total – but there are, thankfully, twelve weeks before the premiere. Therefore, I will post “double-feature” reviews every Friday for the next twelve weeks until we’ve made it through the entire fourth season. On October 19th and 20th, the days before the premiere, there will be additional articles looking back at the legacy of this terrific cult classic. Chuck – Season Four “Flashback” Reviews begin this Friday, July 29th. If you read the reviews on YourHub, then you’ve seen all these articles before – the new stuff will start coming when new episodes air, but I’m reposting the reviews in case there are newcomers to the site or in case anyone would like a refresher on what’s happened so far. 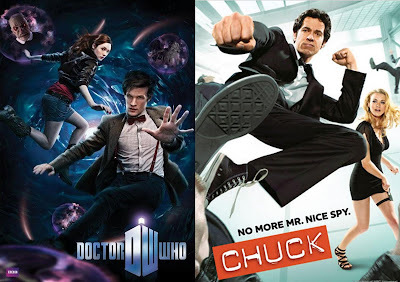 I don’t have time to post my Chuck Season 3 reviews, which was the first year I blogged the show, but they may pop up at some point in the future, and if anyone would like copies, just e-mail me at dinochow@jonathanlack.com and I’ll provide you with a complete set via PDF. I’d also like to quickly draw your attention to some new features on the site; all of my articles are now categorized, and you can access categories on the right-hand side of the screen. For instance, clicking on “Movie Reviews” will take you to all film reviews I have published; when TV blogging begins this weekend, clicking on the category “Chuck” will link to all Chuck reviews, and “Doctor Who” to all Doctor Who reviews. Simple and efficient, I think. There is also now a search engine near the top of the screen on the right – you can use it to search all the articles on the site; I’ve run some tests, and it works very well so far. Next, there is a box above the search engine where you can subscribe to www.jonathanlack.com by entering your e-mail address; you will automatically receive all new posts when they appear. Finally, I have just opened a Twitter Account. Follow @JonathanLack to get updates on all my reviews – any time I make a post, you will get a tweet linking to the article. These are exciting times here on Jonathan Lack at the Movies – although all this talk of TV is making the blog title somewhat irrelevant. Film reviews will continue as normal, of course, so expect lots of content to appear on the site in the weeks to come! “Chuck” Season 4 Flashback Reviews begin Friday, July 29th, leading up to new articles on October 21st. “Doctor Who” Series 6 (Part One) Flashback Reviews begin Saturday, July 30th, leading up to new articles on August 27th.